President Obama spoke to reporters after a grueling two-hour session of negotiations with the House Speaker, John Boehner. His mood was upbeat as he announced that a deal on the debt impasse was near. A new tax rate of 0% for those earning over $100,000 and for corporations. A $5-Trillion cut in social spending “we can’t afford”. On the chopping block: Education, Child Nutrition, Planned Parenthood, EPA, Public Radio, NEA and the SEC. A special commission will be formed to further identify $2 Trillion worth of cuts in Medicaid, Green Stamps and Social Security payments. A Balanced Budget Amendment to the Constitution will be immediately introduced. In return the Debt Ceiling will be raised by $500 Billion, enough to function for a full 3 months. At that time another healthy round of compromise talks will be required. When asked where the compromise was Mr. Obama said: The Republicans wanted to eliminate taxes only on those earning $250,000 and more. I beat them down to protect our middle class. They also wanted to raise the debt ceiling for only another 1 month but had to give in. Over all I would say we all had to give something up and share the pain. In the end I think we came up with an approach that works. Paul Ryan has a Heritage Foundation study he ordered yesterday. They have shown that with these marginal rates our GDP can grow at 12% per year indefinitely. That will go a long way. We actually need about a 14% growth rate to handle the deficit targets, so he will tell the Heritage Foundation to revise the study accordingly. Then we will score this proposed bill as revenue neutral. Reporters have mobbed the Speaker, John Boehner. Reporter: Mr. Speaker, I believe you and the President have a deal in hand. Could you comment? 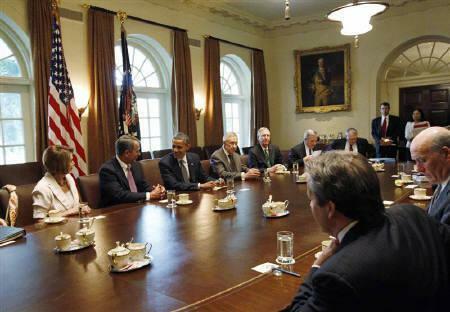 John Boehner: No, I’m afraid we are very far apart. We have competing visions for America. We believe in Free Enterprise and the President keeps pushing Big Government. No one wants a debt default by the United States, but we will not mortgage our future and the President is frankly mulish in his stands. My caucus wants a further boost to our energy policy by investing $700 billion in tax incentives for the oil companies. We must also abolish the FAA and the International Monetary Fund. Reporter: But these are new demands on the table, aren’t they? 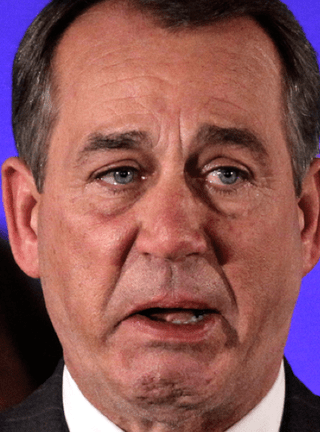 John Boehner: We re-scored the last plan. It didn’t measure up. Our Tea Party caucus will not vote for the Bill as it stands. The President has invited reporters to update them after an hour long session with the House leaders. The President: After an hour of tense negotiations I have decided to compromise further to achieve our goal of fiscal soundness in a fair and balanced way. Our current crisis was the fault of both parties and we now both will have to agree on the fix. So I am announcing that I am supporting Boehner’s proposal in full. The FAA has already laid off all its employees and is renting its office building to J. P. Morgan’s Arbitrage Division at a fantastic rate of rent for the government. God Bless America! Paul Ryan, Eric Cantor, Michelle Bachman, and several other newly elected ultra-conservative Congressmen and women have gathered for a press conference. They are all dressed in brown shirts (blouse in the case of Bachman) and wearing flag lapel pins. Fox News Reporter: Mr. Cantor. Are you now supporting the Debt Ceiling compromise? 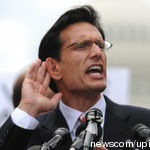 Cantor: Hell, No. This President has no plan and does not wish to address the dire issues our runaway spending is causing this country. CNN Reporter: But, Congressman, he has agreed to everything you guys were asking for? A Constitutional Amendment to define marriage as between a man and a virgin woman only. Authority to strip mine for minerals in the Grand Canyon and Yosemite. Abolish the State Department and require posting of the Ten Commandments in the President’s residences in Afghanistan, Iraq, Yemen and Jeruselam. Fox News Reporter: So he must agree to these before you support the plan? Cantor: No, we will not endorse any plan that he supports. We were not elected to carry on the tax and spend policies of this irresponsible and dangerous president. Thank You all for coming. I would like to see you do a Stand-Up gig now! Consumer-spending will go up and boost California economy. Incredible foresight or you must be clairvoyant! !